Communication nowadays it about more than being able to dial or send a message to employees or partners. In today’s digital workplace, communication needs to be agile, mobile and collaborative. It’s about being able to message, meet, share and call instantly in a way that strengthens relationships and increases productivity. Cisco Webex delivers a powerful set of communication services for all the ways you need to communicate. The service makes instant communications and live meetings possible through a deeply integrated set of industry-leading communications tools for an unmatched collaboration experience—that only the Cisco cloud can deliver. Cisco Webex Teams is an app-centric cloud-based service that provides a complete collaboration suite for teams to create, meet, message, call, care, whiteboard and share whenever and wherever. It is built to make teams work seamlessly, with a simple, secure, complete, and open service that enables people to work better. Maybe you’re a startup business with an ad hoc solution, or you have an outdated key system or PBX that you want to upgrade. Perhaps you’ve already made the move to the cloud and want to expand your capabilities even further. Cisco Webex Teams will take your communications to the next level by providing the benefits of a complete business collaboration service for everyone in your company. Meetings: Bring together to create, communicate and collaborate in a one continuous workstream before, during, and after the meeting so teams can be even more effective, across any mobile or video device. Invite others to join meetings from their desk, a branch office, at home, or on the road. Messaging: The ability to exchange messages and share files with another person or a group of people. Choose someone from your company directory or simply enter anyone’s email address and start messaging customers, partners, anyone you need to work with. Calling: Cisco Webex includes a cloud-based phone system. With Cisco Webex, you can make calls to any other Cisco Webex user in any company via SIP dialing, as well as calling regular landline and mobile phones via the PSTN1. You can make and receive calls from a phone connected to the Cisco Webex service in the office or from the Cisco Webex Team app on your mobile phone or desktop. Try it yourself and request the free 30-day trial! Cisco Webex Teams comes with some great elements for efficient collaboration. One of them is the Cisco Webex Board; a touch-based, all-in-one collaboration device. Use the digital whiteboard and video conferencing system to create and share with your team, from any device, whether you’re together or apart. The elegant Cisco Webex Board replaces your conference rooms’ presentation and video screens, whiteboards, phones, cameras, microphones, and all the cables that come with them. 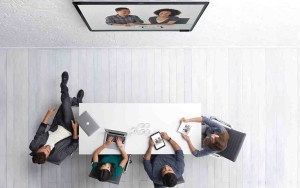 Connect the Board to your Cisco Webex Team Space and get the creative process started. As one of the Cisco partners, Duppal can help you set up a full cloud collaboration experience. We are happy to help you get your collaboration and communication to the next level with Cisco Webex Teams.